How would you like to have a Wi-Fi hotspot in you car? 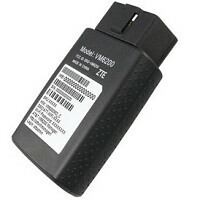 While some automakers are equipping their new vehicles with Wi-Fi connectivity, AT&T and ZTE USA are teaming up to present the ZTE Mobley. Launching on September 11th, the plug-in device will be available at AT&T, and from a special website (www.att.com/mobley). The Mobley plugs into the on-board diagnostics port (OBD II) that most cars from 1996 to the present, now have. When you turn over the ignition, the ZTE Mobley turns on and quickly offers a Wi-Fi connection for up to five devices, using AT&T's 4G LTE network. And if you sign up for a two-year contract, the device is absolutely free. If you don't want to get handcuffed for 24 months, the ZTE Mobley will cost you $100. You can add the Mobley to a Mobile Share Value Plan for a $10 monthly access charge. You can also use a DataConnect plan and get 1GB of data for $20 or 3GB for $30. I really don't know if my car has that port. Never mind. My SUV comes with On board Wi-Fi. Right. Cause Chinese is such a common second language in America. I don't really see the point of this device. So what, now I can use my laptop to access the Internet while I'm in my car? 99% of all devices we bring with us in the car already have data plans attached to them. This seems like a rip off. I fail to see the point of such a device when phones can be hotspots too. That is, unless you made the mistake of signing up with a carrier that doesn't let you do that, when it's a case of taxing a low IQ. I'm getting this for my '84 Porsche, its already got CarPlay like modern cars and now this!.... Love it.. and I do sign 2 year contracts with at&t...already... Edit: nevermind OBD2 only... Bugger.. Does the aftermarket CarPlay set come with USB? You could just install an Mifi USB adapter in it. Shame they made this device OBD2 without implementing the OBD2 part using Bluetooth. I don't understand the purpose of this device either being that most people can tether their alotted data from their smartphone or tablet. Why not just use a hotspot device you can take anywhere.. I think At&t might be making money sharing your driving habits with insurance companies and NSA. Ok I get the reasoning behind this, but. One: Plugging something into diagnostic port, can potentially open for wifi hacking of your car, hopefully it just draws power from it or such. Two: why would you not just create the hotspot with your phone? Now all cars can be hacked. Just hook all this in to the ctOS, and you've got a real life Watch Dogs.